Opt out of stress in your made-to-order product manufacturing. Configuring, assembling, and selling a made-to-order product doesn't have to be an overly complicated process. Manufacturing, SalesPad Desktop's solution, makes configuration a piece of cake. 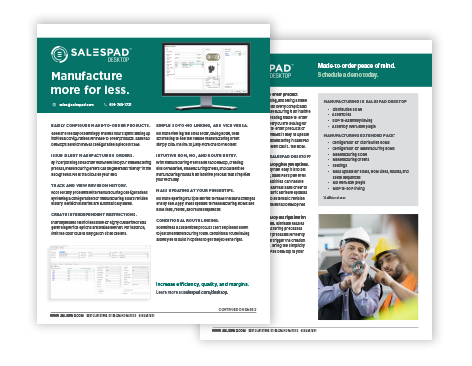 Learn more about SalesPad Desktop's powerful Manufacturing add-on. Download the fact sheet to learn how you can build it smarter, faster, and better.